Psyche, from the Greek psu-khê, possibly derived from a word meaning "warm blooded:" Life, soul, ghost, departed spirit, conscious self, personality, butterfly or moth. Some words with similar meanings: Thymos, meaning breath, life, soul, temper, courage, will; Pneuma, meaning breath, mind, spirit, or angel; Noös, meaning mind, reason, intellect, or the meaning of a word; Logos, meaning word, speech, idea, or reason. Psychology: Reasoning about the soul. Probably coined by the German philosopher and reformation theologian Philipp Melanchthon in the mid 16th century. First used to mean "study of the mind" in Christian Wolff's Psychologia Empirica (1732) and Psychologia Rationalis (1734). Western intellectual history always begins with the ancient Greeks. This is not to say that no one had any deep thoughts prior to the ancient Greeks, or that the philosophies of ancient India and China (and elsewhere) were in any way inferior. In fact, philosophies from all over the world eventually came to influence western thought, but only much later. But it was the Greeks that educated the Romans and, after a long dark age, it was the records of these same Greeks, kept and studied by the Moslem and Jewish scholars as well as Christian monks, that educated Europe once again. We might also ask, why the Greeks in the first place? Why not the Phoenicians, or the Carthaginians, or the Persians, or the Etruscans? There are a variety of possible reasons. One has to do with the ability to read and write, which in turn has to do with the alphabet. It is when ideas get recorded that they enter intellectual history. Buddhism, for example, although a very sophisticated philosophy, was an oral tradition for hundreds of years until committed to writing, since the Brahmi alphabet was late in coming. It was only then that Buddhism spread throughout Asia. The alphabet was invented by the Semites of the Mediterranean coast, including the Hebrews and the Phoenicians, who used simple drawings to represent consonants instead of words. The Phoenicians apparently passed it on to the Greeks. The Greeks improved on the idea by inventing vowels, using some extra letters their language had no use for. Prior to the invention of the alphabet, reading and writing was the domain of specialized scribes, concerned mostly with keeping government records. Even in the case of the Phoenicians, writing was more a tool of the merchant class, to keep track of trade, than a means of recording ideas. In Greece, at least in certain city-states, reading and writing was something “everyone” did. By everyone, of course, I mean upper class males. Women, peasants, and slaves were discouraged from picking up the skill, as they would be and still are in many places around the world. If you wonder where all the women philosophers are, well, there were very few indeed! The poet Sappho of Lesbos is the closest we get to a female philosopher on record in the ancient world. Still, the alphabet does not explain everything. Another thing that made the Greeks a bit more likely to start the intellectual ball rolling was the fact that they got into overseas trading early. Their land and climate was okay for agriculture, but not great, so the idea of trading for what you can’t grow or make yourself came naturally. Plus, Greece is practically all coastline and islands, so seafaring came equally naturally. What sea trading gives you is contact with a great variety of civilizations, including their religions and philosophies and sciences. This gets people to thinking: If this one says x, and that one says y, and the third one says z, what then is the truth? Traders are usually skeptics. Still, the Phoenicians (and their cousins, the Carthaginians) had the alphabet first, and were excellent sea traders as well. Why weren’t they the founders of western intellectual history? Perhaps it had to do with centralization. The Phoenicians had an authoritarian government controlled by the most powerful merchants. The Carthaginians had the same. Perhaps being surrounded by powerful authoritarian empires forced them to adopt that style of government to survive. The Greeks, on the other hand, were divided into many small city-states, each unique, each fiercely independent, always bickering and often fighting. It may seem disadvantageous, but when it comes to ideas, diversity and even conflict can be invigorating! Consider that when Greece was finally united under Macedonian rule, the flurry of intellectual activity slowed. And when the Romans took over, it practically died. In fact, the ancient Greeks were among the first to suggest that there is a “true” reality (noumenon) under the “apparent” reality (phenomenon), an “unseen real” beneath the “unreal seen.” The question is, what is this true reality? Is it matter and energy, i.e. something physical? This is called materialism. Or something more spiritual or mental, such as ideas or ideals? This is called idealism. Materialism and idealism constitute the two extreme answers. Later, we will explore some other possibilities. A second aspect of philosophy is epistemology. Epistemology is the philosophy of knowledge: How do we know what is true or false, what is real or not? Can we know anything for certain, or is it ultimately hopeless? Again, the Greeks outlined two opposing approaches to the problem of knowledge. One is called empiricism, which says that all knowledge comes through the senses. The other is called rationalism, which says that knowledge is a matter of reason, thought. There are other answers in epistemology as well. In fact, empiricism and rationalism have never been entirely exclusive. The third aspect of philosophy that we will be concerned with is ethics. Ethics is the philosophical understanding of good and bad, right and wrong. It is often called morality, and most consider the two words synonymous. After all, ethics comes from ethos, which is Greek for customs, and morality comes from mores, which is Latin for customs! As we shall see, ethics is the most difficult of the three aspects of philosophy. For the present, we might want to differentiate the extremes of hedonism and cynicism. Hedonism says that good and bad come down to what I like and what I don’t like, what gives me pleasure and what gives me pain. Cynicism says that world is essentially evil, and we can only work at distancing ourselves from it and moving towards the ultimate good, which is God. There are many other aspects of philosophy -- logic, for example, and esthetics, the study of beauty. But metaphysics, epistemology, and ethics are sufficient for now. Greek philosophy didn’t begin in Greece (as we know it); It began on the western coast of what is now Turkey, an area known then as Ionia. In Ionia’s richest city, Miletus, was a man of Phoenician descent called Thales (624-546). He studied in Egypt and other parts of the near east, and learned geometry and astronomy. His answer to the great question of what the universe is made of was water. Inasmuch as water is a simple molecule, found in gaseous, liquid, and solid forms, and found just about everywhere, especially life, this is hardly a bad answer! It makes Thales not only the nominal first philosopher, but the first materialist as well. Since ultimate nature was known in Greek as physis, he could also be considered the first physicist (or, as the Greeks would say, physiologist). We should note, however, that he also believed that the whole universe of material things is alive, and that animals, plants, and even metals have souls -- an idea called panpsychism. Anaximander added an evolutionary aspect to Thales’ materialism: The universe begins as an unformed, infinite mass, which develops over time into the many-faceted world we see around us. But, he warns, the world will eventually return to the unformed mass! Further, the earth began as fluid, some of which dries to become earth and some of which evaporates to become atmosphere. Life also began in the sea, only gradually becoming animals of the land and birds of the air. Like Thales, Heraclitus (540-475) was an Ionian, from Ephesus, a little north of Miletus. And, like Thales, he was searching for the ultimate substance that unifies all reality. He decided on fire, or energy -- again, not a bad guess at all. The multiplicity of reality comes out of fire by condensation, becoming humid air, then water, and finally earth. But this is balanced by rarefaction, and the earth liquifies, then evaporates, and finally returns to pure energy. Taking fire as his ultimate substance led to a more dynamic view of reality. Change, for Heraclitus, is the only constant. “Panta rei, ouden menei” -- all things flow, nothing abides -- is his most famous saying. He is also known for the saying that we cannot step into the same river twice, because new water is constantly flowing onto us. Fire is also associated in his theory with mind or spirit. And, just like any other fire, he points out that our individuality eventually dies. There is no personal immortality. Only God -- the divine fire -- is eternal. In many ways, Heraclitus reminds me of a Greek Taoist. He believed that, although ultimate reality is One, the world we know is made of up dualities, with each pole requiring the existence of its opposite: Up requires down, white requires black, good requires bad, and so on. And he sees these oppositions as being the source of harmony, pointing out that, unless you stretch your harp strings in two opposing directions, you cannot play music. And, again like the Taoists, he believed that the best way to live one’s life is in harmony with nature. But he died alone, at the age of 70, due to his intense dislike for human company! Another Ionian was Pythagoras (582-500). After travelling everywhere from Gaul (modern day France) to Egypt and India, he settled down in Crotona, a sea port of southern Italy. Southern Italy was the greatest settlement of Greeks outside of Greece, to the point that the Romans referred to the area as Magna Grecia (“greater Greece”). There, he set up his famous school. His school was more like a large commune, and his philosophy more like a religion. Because they believed in reincarnation, all of his followers were vegetarians. They avoided wine, swearing by the gods, sexual misconduct, excesses and frivolity. For the first five years, a new pupil took a vow of silence. Women were treated as equals -- a true rarity in the ancient world! His philosophy was rooted in mathematics, which meant geometry to the ancient Greeks. 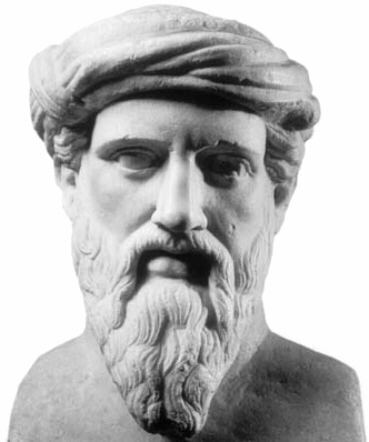 Pythagoras is credited with a number of geometric proofs, most notably the pythagorian theorum: The sum of the squares of the two sides of a right triangle is equal to the square of the hypotenuse. He discovered the mathematical basis of music, and saw the same patterns in the movements of the planets. He is the first person to realize that the earth, moon, and planets are all spheres (hence, the "music of the spheres!"). He saw the elegant lawfulness of geometry as the foundation of the entire universe. So, rather than look for an understanding of the universe in the movement of matter and energy, he looked for laws of nature, the form rather than the material. But, since these laws exist only in the mind as ideas, we call Pythagoras an idealist. Although his life remains mysterious, his school lasted 300 years, and had a profound influence on all who followed, most particularly Plato. In Elea, another Greek seaport in the south of Italy lived Xenophanes (570-475). He is best known for his denial of the existence of the Greek gods. There is only one God, he said, and that is the universe, Nature. This perspective is known as pantheism. Nevertheless, said Xenophanes, all things, even human beings, evolved from earth and water by means of natural laws. But things and people remain forever secondary to the ultimate reality that is God-or-Nature. Parmenides (540-470) of Elea, was a disciple of Xenophanes, and would have a particularly potent influence on Plato. He extended Xenophanes’ concept of the one God by saying “Hen ta panta,” all things are One. Ultimate reality is constant. What we believe to be a world of things and motion and change is just an illusion. One of Parmenides’ disciples was Zeno of Elea (490-430, not to be confused with Zeno of Citium, whom we will look at in a later chapter). Zeno wrote a book of famous paradoxes, including the story of Achilles and the tortoise: Let’s give the tortoise a head start. By the time Achilles gets to where the tortoise started, the tortoise will have move a little further. By the time Achilles gets to where the tortoise had moved, the tortoise will have moved a little further still, and so on. Hence, Achilles can never catch up with the tortoise. The point of the story, and all the stories, is that motion is an illusion. In making his point, he invented the form of dialectic argument known as "reduction to absurdity." Note, however, that his arguments don’t hold up in the long run, because he mistakenly takes motion, time, and space as made up of an infinite number of points, rather than being continuous. Leucippus (fl. c. 440) was from Miletus in Ionia, home of Thales and Anaximander. He studied with Zeno at Elea, then started teaching in Abdera, an Ionian Greek colony on the southern shore of Thrace (northeastern Greece). Although only one sentence of his actual teachings remains, Leucippus will always be remembered as the man who invented the ideas of the atom, empty space, and cause-and-effect. Even the soul, he said, is made up of atoms! 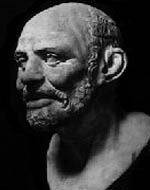 It was Leucippus’ student, Democritus (460-370) of Abdera, who would take these ideas and develop them into a full-bodied philosophy. He travelled extensively, wrote books on every subject, and was considered the equal of the great Plato and Aristotle. But he never founded a school, and so his ideas never had quite the same impact as Plato’s and Aristotle’s on later civilization. Democritus was quite skeptical of sense data, and introduced the idea of secondary qualities: Things like color and sound and taste are more in your mind than in the thing itself. Further, he said that sensations are a matter of atoms falling on the sense organs, and that all the senses are essentially forms of touch. He also introduced the idea that we identify qualities by convention -- i.e. we call sweet things “sweet,” and that is what leads us to group them together, not some quality of the things themselves. This is called the nominalism, from the Latin word for name. This way of thinking doesn't show up again till the late Middle Ages. The soul or mind, he said, is composed of small, smooth, round atoms, a lot like fire or energy atoms, and can be found throughout the bodies of both humans and animals, and even the rest of the world. Democritus did not believe in gods nor an afterlife. In fact, he formed an atheist organization called the Kakodaimoniotai -- “the devils club.” He is sometimes called the laughing philosopher, because he found life much more cheerful without what he considered to be the depressing superstitions of religion. He took Leucippus’ materialism very seriously, noting that matter can never be created nor destroyed, that there were an infinity of worlds like our own, and that there was no such thing as chance -- only causation. It would be many centuries before these ideas would again become popular. A little older than Democrates was Protagorus (480-411), also of Abdera. He is the most famous of the group of philosophers known as the sophists. The word comes from the Greek sophistai, which means teachers of wisdom -- i.e. professor. Because some of these professors taught little more than how to win arguments in court, and did so for exorbitant fees, the name has become somewhat derogatory. Sophistry now means argument for argument’s sake, or for the sake of personal gain. But then, it is also the root of the word sophisticated! Protagorus, although his teaching fees were in fact high, was a serious philosopher. He can be credited with founding the science of grammar, being the first to distinguish the various conjugations of verbs and declensions of nouns. He was also a major contributor to logic and was using the Socratic method (teaching by question and answer) before Socrates. He was a skeptic, and believed that there were no ultimate truths, that truth is a relative, subjective thing. “Man is the measure of all things,” is his most famous quote, meaning that things are what we say they are. Applying this skepticism to the gods, he scared the Athenian powers-that-be, and he was ordered to leave Athens. Apparently, he drowned on his way to Sicily. Into this idea-rich environment would come the three Athenians that would come to dominate philosophy for the next 2000 years: Socrates, Plato, and Aristotle.